These images from NASA's Hubble Space Telescope show four examples of interacting galaxies far away from Earth. The galaxies, beginning at far left, are shown at various stages of the merger process. In the last 9 billion years, just about every galaxy has had, on average, one major collision with a neighbor, a new study reveals. 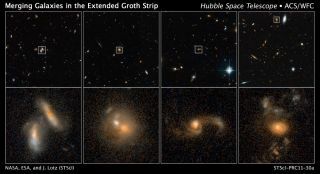 The discovery, made by astronomers studying data from the Hubble Space Telescope, provides the most accurate check yet on the rate of galaxy collisions in our universe, scientists said. Researchers used Hubble photos of galaxies large and small, as well as a computer model of how these cosmic car crashes take place. Though such cosmic fender-benders sound violent, the stars within galaxies almost always emerge unscathed, because of the vast distances between them. The galaxies themselves do get bent out of shape and end up merging into larger galactic systems, bound by mutual gravity. "Having an accurate value for the merger rate is critical because galactic collisions may be a key process that drives galaxy assembly, rapid star formation at early times, and the accretion of gas onto central supermassive black holes at the centers of galaxies," study leader Jennifer Lotz of the Space Telescope Science Institute in Baltimore, Md., said in a statement. Previous studies had only been able to determine that anywhere between 5 percent to 25 percent of the galaxies in the universe were merging. The new work has placed more precise boundaries on that estimate. Lotz and her colleagues found that small galaxies collided even more frequently with large galaxies, with clashes between dwarf and massive galaxies in the distant universe occurring three times more often than crashes between two heavy galaxies. "Dwarf galaxies are the most common galaxy in the universe," Lotz said. "They may have contributed to the buildup of large galaxies. In fact, our own Milky Way galaxy had several such mergers with small galaxies in its recent past, which helped to build up the outer regions of its halo. This study provides the first quantitative understanding of how the number of galaxies disturbed by these minor mergers changed with time." The findings will be reported in an upcoming issue of The Astrophysical Journal.